Register Log In ECN Forum Forums Photo Gallery Desk-mounted "power-board"
Assembled by myself, as described in a previous post of mine, into my home PC desk (the underside of the brown desktop is visible at the top of the picture). 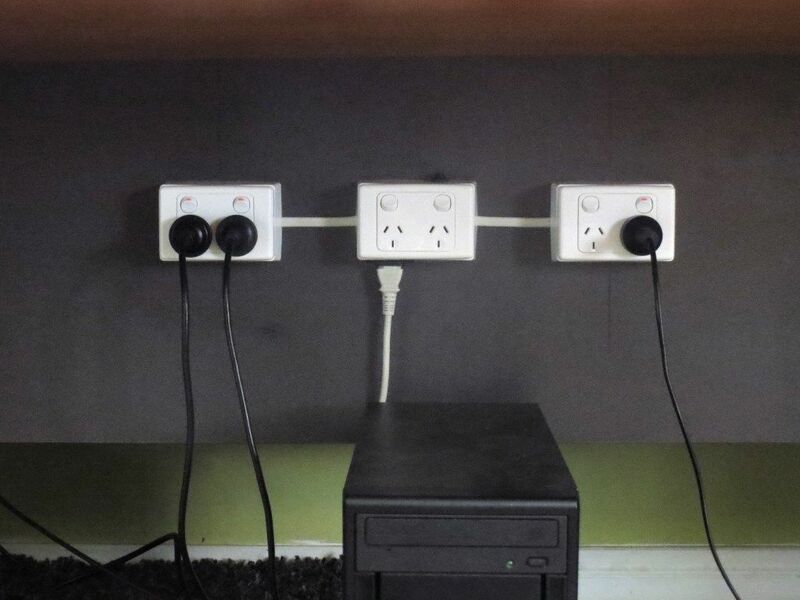 Functionally, it's the same as a normal off-the-shelf Australian power-board (including the 10A thermal circuit breaker, just about visible at the top of the centre outlet block), but by being mounted to the desk facilitates easier access. The TPS cables between the outlet blocks are 1.5mm2, with 7-stranded conductors. Each block is mounted to the surface with 6 chunky timber screws, and I used plastic (nylon?) screws at the IEC 60320 C14 inlet to ensure that they can never become live. If you want some additional (construction-stage) photos, then I'll upload them at Electrical-Photos.com. If anyone else here has built something similar, then do mention it (and, if you like, show it off). Last edited by LongRunner; 12/21/16 12:21 PM. Are you sure that complies with AS/NZS 3000? Personally I would have used a 4-way horizontal socket outlet and a double horizontal socket-outlet, right next to each other, (or even 2 x 4-ways) so that you don't have exposed TPS cables, which should be enclosed in at least Betta-flex, if it is below 1.8m above the floor level. What size circuit-breaker/fuse is protecting this arrangement? Well, no, I don't know if it follows the rules. Having said that, I don't see what would be all that dangerous about it; I wasn't overly concerned about the TPS cables, myself, given how short they are (I can only budge them a few millimetres by hand, and there's not much nearby to damage the insulation), but if you insist, sure, I could look around for something to cover them. In any case, it's not a permanent part of the house itself. Protection here is provided by a 10A thermal circuit breaker like in regular power-boards (which I did mention before - if you missed it, though, that's OK, I'm not offended), on top of the usual C16 MCB on the house circuit it's plugged into. I have tested that 10A thermal circuit breaker a few times after wiring it up, and with 20A of loading (2*2.4kW heaters), it trips in 12-15 seconds each time, so that's fine. At least from checking with matches in a few spots (hopefully not too conspicuous), the desk itself seems to be reasonably self-extinguishing too. So legal or not, this is surely a million times safer than that time when that "handyman" left the outlet in my bathroom hanging by a single wood screw into the plasterboard . Although we all know the rules by heart we also know that the highest instance of electrical rule violations is in the electricians' shop...regardless of what country we're in. Just to satisfy me curious mind, You have a 10 amp circuit breaker, and it remains 'on' for 12-15 seconds with a 20amp load?? Sounds a little to long of a time curve tome. Also, you did a flame spread 'test' with matches?? I have datasheets on hand for two equivalents to the breaker I used (albeit not the exact unit). One states tripping in 5-35 seconds at double the rated load, the other states 4-40 seconds. This breaker was actually a bit quicker to trip than those I checked in a few other power-boards (though they were still reasonable), though I'll admit that isn't saying much statistically. I know using matches is an awfully crude way of flame testing, but on the upside, at least they haven't done too much damage to the desk. Nice job. Three times the two ways SO's will work out cheaper then the overpriced 4 way power socket outlets. Don't get me wrong, I wasn't intentionally trying to pick holes in your work, although I probably came across as doing just that. And as RODALCO mentioned, them 4 way socket-outlets are rediculously expensive for what they are and like you said, the spacers that go in behind them are pretty shallow. I have to say, that looks like a pretty nice install though, one thing that really annoys me is crooked switches and socket-outlets, there is a local domestic electrician here, who by default ALWAYS fails to make sure the fittings are level or plumb, it's not a good look at all, especially if you're paying a guy to have this work done.